It is just over one year since protestors gathered in Kiev’s Maidan Nezalezhnosti in protest at the Mykola Azarov government’s decision not to sign an ‘Association agreement’ between Ukraine and the EU. Since then, the country has moved closer and closer to economic, political, social and ethnic catastrophe. In October, parliamentary elections organised by the Kiev government over most of the country resulted in the consolidation of a more pro-EU, pro-war parliament. This was followed on 2 November with elections in the rebel-held republics. Despite the ceasefire agreed in September, an undeclared war continues in the east of the country. Over 300 people were killed in the last half of October alone, with prolonged fighting around Donetsk airport and lately around the town of Debaltsevo. A number of European countries have reported an increase in incursions into European airspace by Russian fighters and bombers. According to NATO’s top commander, there are “larger, more complex formations of aircraft flying more ‘provocative’ routes than usual” and there are numerous reports of an increasing presence of Russian troops in the region. This comes after years of NATO’s eastward expansion and its military aid to the Kiev regime. The results of the Supreme Rada (parliament) election on 26 October will dash the hopes of those who participated in Euromaidan wanting to contest the power of the oligarchs. With just over 50% of the electorate participating, six parties gained the 5% needed for parliamentary representation. All the parties are linked to the oligarchs, including that of the President and food industry oligarch, Petr Poroshenko. His party received 21.8% and the People’s Front of Prime Minister Arseniy Yatsenyuk won 22.2%. Three other pro-European parties took another 23% between them. The Opposition block, generally considered to be a successor to Yanukovich’s Party of the Regions, gained 10%. 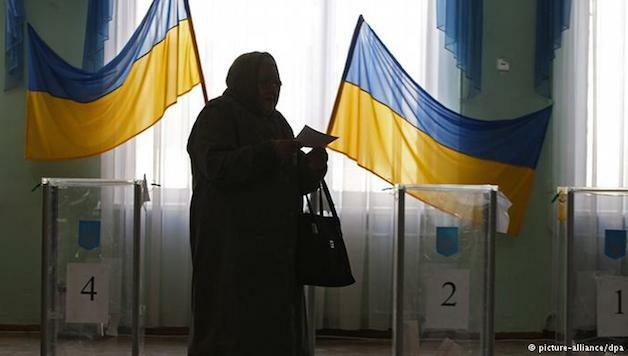 The communist party, which sided with the deposed president, Yanukovich, saw its vote slashed from 14% to less than 4%. The relatively low vote for Poroshenko’s block is significant, as less than six months ago he gained over 50% in the presidential elections. Even though the Ukrainian media, following the example of Russia’s, is now almost monopolised in favour of the sitting President, the hopes voters fostered last May – that Poroshenko’s victory would lead to a speedy resolution of the conflict in the east and open the door for a restoration of the economy – have clearly faded. Two openly far right parties – Svoboda (‘Freedom’) and the Right sector – both did badly in the party lists. Svoboda’s vote dropped from over 10% in 2012 to under 5% today and the Right sector got less than 2%. Part of Svoboda’s vote went to the right-wing populist radical Party, led by Oleg Lyashko, who Amnesty International consider should be arrested as a war criminal. This does not tell the whole story however. Just half the seats are allocated according to the party lists and the remainder go to individual candidates. In this way, Poroshenko’s block and the People’s Front gained another 90 odd seats and so-called ‘none-party candidates’ occupied another 100 places. Svoboda picked up six seats and Dmitri Yarosh, leader of the Right Sector, was elected in one of the constituencies on the edge of the rebel Donetsk region. Also elected in this way were a number of paramilitary leaders of the various “battalion’s”, including the head and deputy head of the pro-Nazi ‘Azov battalion’. To complicate matters further, in parts of the country the election did not take place at all. Apart from Crimea, now under Russian rule, voting for the October elections was also impossible to organise in another 15 areas in the Donetsk and Lugansk regions. These areas, covering some 5 million people, are under the control of opposition forces. Notwithstanding this, the voting was clearly divided along regional lines. The south, including Odessa and central Ukraine (Kiev), voted for Poroshenko’s block, the north-east for the opposition block and the western regions for the People’s Front. The new Supreme rada is full of new deputies horse-trading for places and positions – some did not even wait for election day before opportunistically switching parties. As the Ukrainian media outlet Korrespondent.net put it: “The new Supreme Rada has not even begun work, and it is already being shaken by ‘careerist’ scandals…” Apart from the already dominant position of Poroshenko, a struggle has broken out for influence between the two oligarchs – Kolomoiskii (who has gained notoriety by financing the far right and building his own army) and the more eastern-orientated energy oligarch, Firtash, who is currently facing bribery and corruption charges in the US. Until this “process of buying and selling comes to an end, attempts to form a stable coalition are not possible”, commented Korrespondent.net. 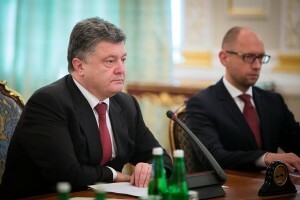 However, at least for a period, it is likely that a coalition similar to that of the current government will be formed between Poroshenko’s block and Yatsenyuk’s People’s front. It was reported that the Radical Party has joined talks too. This will mean that the government will be able to present an apparently united face before western governments when promising “economic reforms and austerity” in an attempt to get financial aid form international bodies, such as the EU and IMF. It certainly needs help with the economy, which is sinking further into a black hole. Some forecasts say the GDP will have fallen by 10% by the end of the year, in part because of the collapse of heavy industry by 30% in the east of the country. Only 24 of the 93 coal-mines in the east are operational. Many miners have to contend with shelling to get to work. They have not been paid for months and have started to organise demonstrations in Kiev to demand payment. The coal they produce is dispatched to the state coal purchasing organisation, but when they ask for payment they are told the money has been used for the war. Ukraine has even started to import coal from South Africa. Since the beginning of the year, the national currency, the Hryvna, has fallen by 40%. Yet the western powers are not delivering the economic assistance that is desperately needed. During a recent visit to the US, President Poroshenko did everything he could to persuade Congress to support Ukraine in its battle against “Russian imperialism”. But he was only promised a paltry $53 million, which is only enough to finance nine days of government forces’ fighting. 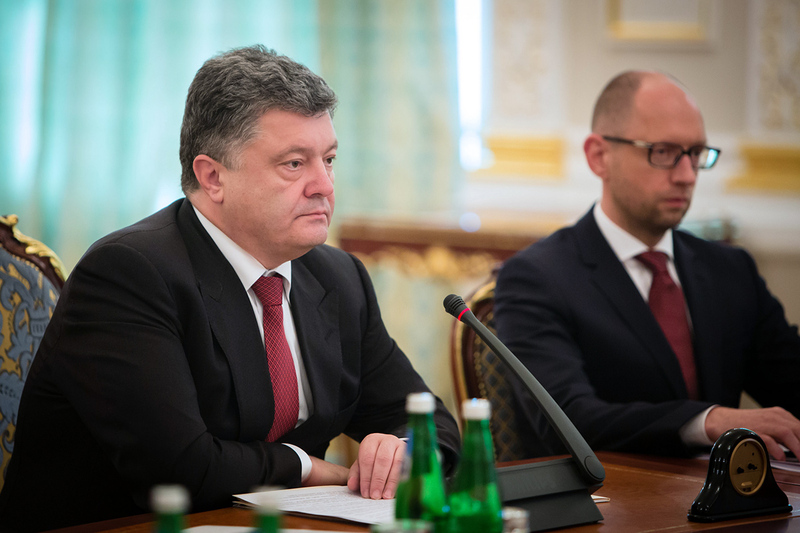 While Poroshenko’s block and Yatsenyuk’s Front are, more or less, in agreement over the economy, as far as the situation in the east is concerned they have different positions. Although Porosheko presents himself as a supporter of peace through negotiation, his speech to the US congress was hawkish. All the other pro-European parties elected to the Rada support military action to bring the east back under Kiev’s control. These political forces, backed by military commanders and warlords, will make it even harder to find a negotiated solution. At the time of writing, the Rada is discussing removing the ‘special status’ for the Donetsk region, agreed at the Minsk talks between Kiev and the opposition, last September. Now Poroshenko has ordered his military commanders to dispatch troops once again to strategic areas in the East. The position of the far-right groups and some of those activists from Euromaidan protests is that if the Poroshenko-Yatsenyuk government does not deliver, they will mobilise another Maidan movement. Even if this does not happen, the very threat of such action will keep pressure on Poroshenko and may force him to take a more hawkish approach than he wishes to do. In each region, the vote was won by the incumbent rebel military commander. 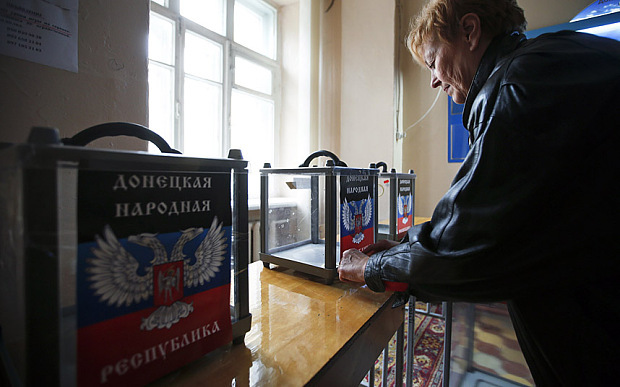 In Donetsk, for example, Alexander Zakharchenko won 80% of the vote. He first gained his position in September after the more uncontrollable and unpredictable leaders, such as Strelkov, were pushed out, it seems, under pressure from the Putin regime in Russia. Zakharchenko may present a more moderate image than his predecessor but he is still linked directly to Russian far right forces and to the reactionary ‘Russian orthodox army’, which played a major role in the military conflict. The pro-Putin news agency, Russia Today reported that Roman Lyagin, head of the election commission for Donetsk, said that Zakharchenko received over 765,340 votes. Lyagin refused to give percentages “because he thinks that absolute numbers are more open and precise”. To try and gain credence for its election, international observers were invited from the so-called ‘Association for Security and Cooperation in Europe’, a ‘clone organisation’, intended to mimic the OSCE. In one of the most cynical moves possible, considering that the Donetsk and Lugansk ‘People’s republics’ were supposedly established to resist the growth of fascism in West Ukraine, one of the observers from the “ASCE” was from the Austrian Freedom Party and another was none other than Alexandra Mussolini, the granddaughter of Italy’s fascist dictator. Of those that voted in the elections in the rebel Donetsk republic, over 80% voted for Zakharchenko. According to the official electoral register, there are 3.2 million voters in the region controlled by the rebel republic, but just over a million voted making turnout less than a third. This is despite special measures taken to boost turnout by allowing people from outside the region to vote, reducing the age to 16 “just like in Scotland” and allowing people to vote wherever they liked. 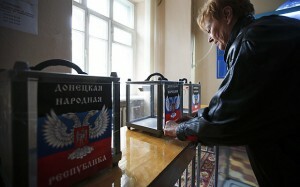 In the rest of the Donetsk region, 400,000 took part in October’s vote to the Kiev parliament. Elections are always little more than a reflection of the mood at a particular time. This election took place in a region ravaged by war from which a large section of the population has fled. Less than a third of Donetsk’s population was still in the city in late summer. Hazarii Sergeyev, a journalist in Donetsk, describes the mood in the city: “political reality in the ‘independent republic’ of Donetsk is based on a feeling of inescapability. There are real enthusiasts who believe in the future of the republic. But there are also those, who during the course of the political cataclysm have lost everything: their status, business, income and therefore quietly hate the new authorities. On the whole, there is no particular movement either in support of independence, or for the new “leaders”, who are seen as lacking charisma. But nor do they want to live in the old way, “with the oligarchs and fascists”. They are particularly afraid of the Right Sector. Too much blood has been spilled in the past period. It is difficult to say exactly what the mood of the people is. It is always changing. In the spring, there were many more supporters of maintaining a unitary state (i.e. Ukraine). But those who associate themselves with a unified Ukraine have left, or are sitting quietly, not expressing their opinion, because to talk about a single state in Donetsk today is dangerous, and that is no exaggeration… At the same time, people find it difficult to understand how things will go now: who will pay pensions and wages, who will repair the damage, how the factories will work… On the other hand, the death of so many people as a result of the fighting is only increasing the antagonism”. It was mainly older people who turned out to vote, who have been unable to leave and who are most prone to support ‘Soviet nostalgia’. Other commentators report that there is a minority who want to see an independent Donbass, but they have lost some of their faith in the idea because Russia did not push its advantage over the summer. In addition, there is the realisation that Russia, in its current economic state, cannot simply bail out the 5 million-strong region. There is still a significant layer that wants a federal Ukraine so that they can live without the intervention of the Kiev army. If Kiev launches a new assault, these people could be driven into the hands of the Kremlin, but if Russia is seen as provoking new conflict the mood could backfire on Putin. The Russian press have carried articles claiming that apart from western sanctions the main reason that Russia held back from further military intervention in Ukraine last summer was because the population in Donetsk was not enthusiastic about intervention. What seems to be happening in the Russian-speaking areas that have not been taken over by the rebel republics, including significant parts of the Donetsk region, is a hardening of a mood against further incursions by Russia. This mood, fuelled by a fear of military action similar to that that is destroying Donetsk, can be seen in towns such as Mariupol and other large traditional “pro-Russian” cities, such as Kharkov, Zaporozhe and Dnepropetrovsk. It is still probably true that the position of the Kremlin is to maintain the Donetsk and Lugansk republics as “frozen conflicts”, as levers they can use to pressurise the Kiev authorities. But while they may wish for this, the actual situation means that, by the day, this approach is becoming more untenable. The situation on the ground, with a winter fast approaching that is forecast to be particularly harsh, is looking grim. After the Ukrainian authorities cut back on water supplies, the mayor of Sebastopol announced that water will only be available for a few hours a day, returning to the situation in the worst days after the collapse of the former USSR. The Ukrainian electricity network also announced that because of the drop in coal output from Donetsk, they will no longer be able to supply Crimea. The Crimean tourist industry collapsed over the summer and now defence factories on the peninsular are complaining they have not received promised state orders because, as a condition, they have to sell a quarter of their shares to Russian corporations. Wineries in Crimea are also on the verge of closure, as they have not been able to readjust to the Russian legal system. Several of the twenty or so Russian banks that located to the peninsular after the Russian takeover have begun to withdraw, citing high rental costs and a small market due to low wages. Despite promises to rapidly build a bridge linking Crimea to mainland Russia, the Kremlin has run into major problems. Likely contractors from China and Canada have warned of the dangers of relying on such a bridge in winter, when the Kerch gulf, at that point, experiences severe storms and freezing. Indeed, at the moment, the peninsular is cut off by a storm. Now the transport ministry is raising the idea of using students to do all labouring work – a policy reminiscent of how the gulag prisoners were exploited as slave labour under Stalinist rule. This of course will not be popular with students. First year undergraduates are already faced with losing their grants, which are already miserly, for the first term so that the money can be used to ‘support’ the Crimean universities! Two of the three main opinion polling organisations in Russia, which like the mass media tend to reflect the Kremlin’s outlook, nevertheless noted significant falls in Putin’s ratings from the high he reached in early summer. The Levada Centre noted a fall from 57% approval ratings, in August, to 49% in September, and VTsIOM saw a fall from 66% to 62%. Another poll by the same organisation at the beginning of November reported that while a vast majority of the Russian population support the annexation of the Crimea, 68% are against participating in the military conflict on the side of the rebels in East Ukraine. Although Putin’s ratings could climb again due to developments around the Ukraine crisis and his beating the nationalist drums, the polling organisations warn that the current decline in his support may continue. It could fall all the way back down to the levels of January (25-35%), they state, because of the growing tensions in Russian society. One of the main reasons for this is the desperate economic situation developing in Russia. Even before sanctions, the Russian economy was bumping along on the edge of recession. Official figures indicate that the year will end with zero growth, and a recession is forecast for 2015. The omens are not good. 2014 has been a record year for capital flight from Russia. The ruble collapsed by 20%, this year, despite massive central bank support. Now the price of oil is dropping, by 25% since June. And this is before sanctions hit, which make it practically impossible for companies to get cheap credit (Russia’s central bank rate is 9.5%). These critical factors, as well as the extra costs of integrating Crimea and financing the rebel republics in Ukraine, have blown a hole in the state’s finances. The national pension fund has already been raided to compensate the large banks for losses due to western sanctions. Most significantly, the federal and regional budgets are now being attacked. While budget funds for the military and police are being increased from 29% of GDP to 35%, the share for health care is to drop from 4.4% to 2.7%. By April 2015, 26 of Moscow’s 46 hospitals are to close or merge, with 7,000 medical workers losing their jobs. There have already been two large protest meetings in Moscow over these cuts, with another planned for the end of November. Superficially, the ruling elite around Putin are united. But there are clear conflicting interests within the ruling circle that Putin struggles to control. Those sections of the elite linked to the banks and big finance are suffering most from sanctions and they gain least from further incursions into Ukraine. To appease them, a special law was passed to compensate them for their losses from sanctions. On the other side are those who head the armed forces and an increasingly strong military industrial complex. They posit the idea that western powers are led by the US led in a conspiracy against Russia. As a result of state repression following mass protests in central Moscow against electoral fraud two years ago, the more ‘liberal’ wing of the elite is side-lined. If Putin decides to push further into east Ukraine, in what is referred to as ‘Novorossiya’, either as a result of the situation in the east getting out of control or because of a conscious decision to open a path to Crimea, differences within the ruling circle will widen. Given the situation in the economy, this means that whatever approach Putin chooses to take regarding Ukraine could be very risky. Whether in Kiev, Donetsk or Moscow, the working class is paying for the crisis, while the ruling elites, with their armies and warlords continue to battle over control of the wealth and resources of the two countries. The working class is mainly poorly organised. The organisations it has, mainly independent trade unions, represent a minority and tend to restrict themselves to economic issues. What is needed is for the working class to put its mark on events by organising united struggles against attempts to restrict the rights of national minorities, to pit workers from different ethnic backgrounds against one another, against war and against budget cuts. A workers’ alternative is needed to economic crises and to establish powerful political parties, armed with socialist policies that can offer a way out of this nightmare. This entails ending the rule of oligarchic capitalism and replacing it with a democratic and voluntary federation of socialist states. Previous articleVenezuela: Scarcity and Speculation – Whose Fault Is It?